The development of SECUREA Toyota Kakimoto in Toyota City, Aichi Prefecture, has been completed. SECUREA Toyota Kakimoto is a town with 21 single-family, energy self-sufficient houses, where electricity is interchanged between the houses. 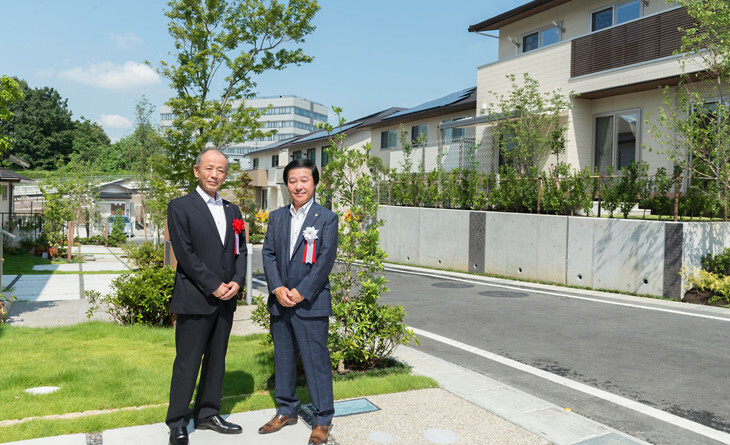 SECUREA Toyota Kakimoto has been officially opened as the sixth town of the SMA × ECO PROJECT,*1 which we proposed as a project in relation to the sale of property owned by Toyota City (Aichi), an environmental model city, and for which we were selected as the contractor. In this town, a system, which enables residents to use energy reasonably, efficiently, and comfortably, is adopted. This is a smart town that aims to reduce its CO2 emissions and achieve peak-cut and peak-shift of its energy demand. *2 A town where the annual net primary energy consumption is zero or almost zero as a result of the improvement of the energy saving performance of the skeletal structures and facilities of houses and the effective use of renewable energies. 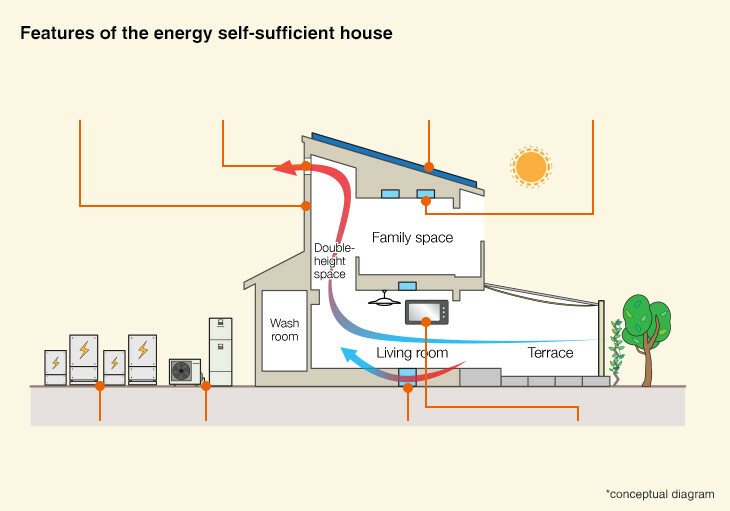 There is a limit to how much contribution a single house can make to energy saving. We enhance the effective use of energy and accompanying reduction of CO2 emissions by the collaborative efforts of the entire town block. One of the efforts based on this concept is power interchange among single-family houses in the block. There have been some examples of power interchange by block, but some of these projects required a special designation by the national government to provide specific power supply or, in some projects, a large-scale energy management system needed to be additionally built to achieve power interchange. Thus, power interchange involving all houses in a block has not yet been widely adopted. 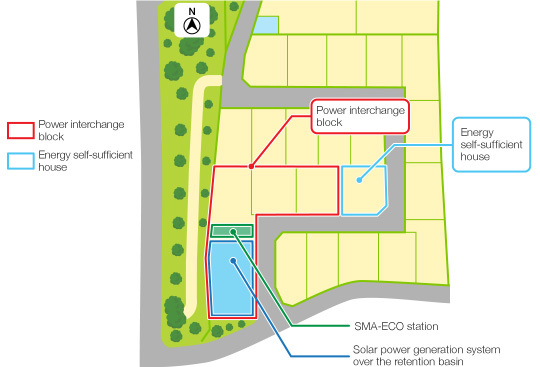 In SECUREA Toyota Kakimoto, the entire power interchange block, consisting of the retention basin equipped with a solar power generation system, the lot for the SMA-ECO station where the community assembly hall is located, and the lot for three houses, is regarded as one unit of demand for electricity. Equipment and devices within the block are connected in such a way as to facilitate power interchange. 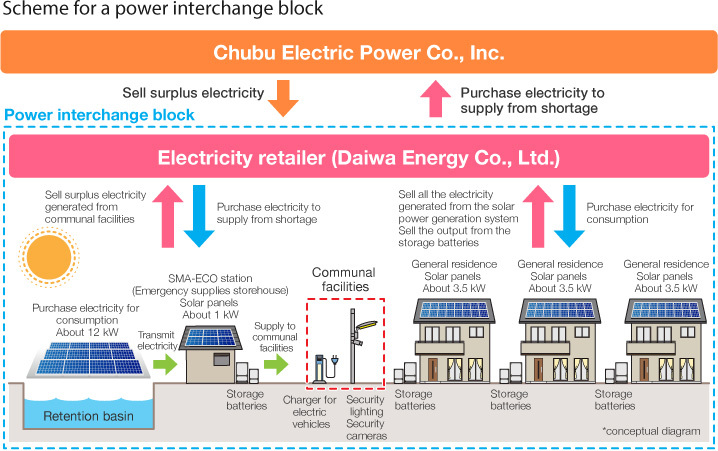 More specifically, with regard to the output from the solar power system and the output from the storage batteries in the power interchange block, Daiwa Energy Co., Ltd., a Daiwa House Group company, purchases the surplus from the community assembly hall and the entire output from the houses, and supplies the purchased electricity to places where there is a demand for electricity within the power interchange block. When electricity falls short within the block, electricity is supplied by an electric power company, and when electricity generation is in excess of demand within the block, the electricity generated from the solar system alone is transmitted to the electric power company. Electricity is generated and consumed within the block to achieve “local production for local consumption” to reduce the consumption of the electricity supplied by an electric power company as much as possible. The unified management by Daiwa Energy of the electricity generated and stored by the solar power generation system and the lithium ion batteries installed in the power interchange block enables us to improve the efficiency of the devices and ensure the stable supply of electricity. The power interchange operation within the town block explained above is a new form of supply and demand of electricity for single-family houses. We will improve the system by reducing initial and maintenance costs as much as possible so that it can be used more widely. Storage batteries are designed to operate only when a certain level of electric power load is applied to prolong the life of the batteries. For this reason, the power consumption of three houses is combined to increase opportunities for the batteries to discharge electricity and to improve battery operation rates and the conversion efficiency at the time of discharge. Under the current fixed price purchase system for renewable energy, the period covered by the fixed price program is ten years for an individual house installed with a solar power system of less than 10 kW. Under our project, the entire power interchange block is designated as one power generation unit and, therefore, a lower unit price for purchase is applied but the period covered by the program is 20 years. 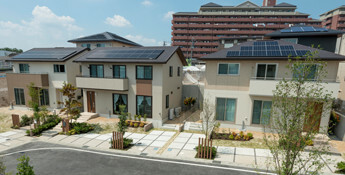 In addition, in this town block, unlike others, the entire amount of discharged electricity from the solar power system and storage batteries can be sold to Daiwa Energy Co., Ltd. During a power outage following a disaster or other emergency, residents can make effective use of the solar power system and lithium ion batteries in the block. The national government is promoting the construction of zero energy houses (ZEH). 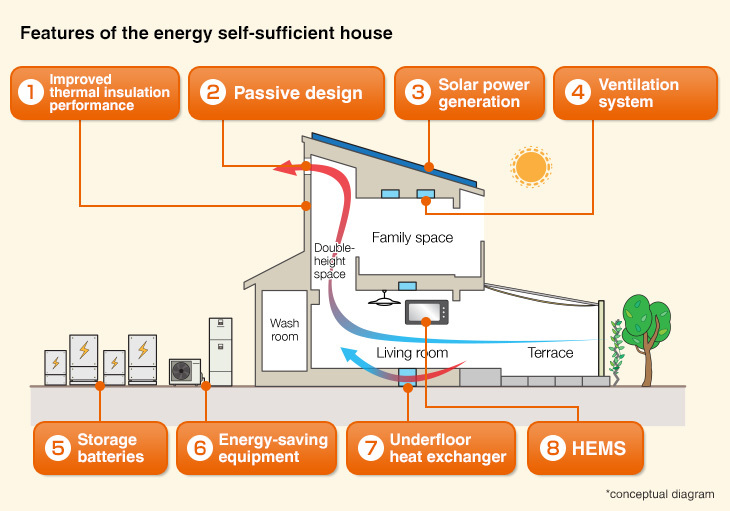 While the concept of ZEH is based on the assumption that the energy balance is ±0, energy self-sufficient houses are designed to reduce their electricity purchases as much as possible. The energy self-sufficient house developed by our company is designed to minimize electricity consumption, instead of increasing the capacity of installed solar power systems. The energy consumption of the house is managed in such a way as to eliminate wasted energy and the electricity to be consumed is that generated by solar power systems and stored electricity. In developing the energy self-sufficient house, we tried to achieve a realistic price to facilitate its spread nationwide. One of the features to reduce energy use is its water heater. Water heaters commonly used in households use low-rate night time power to heat water, and hot water is stored to be used during daytime hours. Our model heats water using electricity generated by the solar power system during the day. With this model, the electricity generated by the solar power system can be immediately used to heat water. In addition, the use of the water heater during the time when the outdoor temperature is high helps improve the efficiency of the water heater itself. Surplus electricity from the solar power system is stored in batteries. While night time power is usually purchased to be stored and used during the day, our model is designed so that surplus electricity from the solar power system is stored during daytime hours to be used by the family at night. In addition to the improvement of these devices and better thermal shielding performance, passive design also plays an important role. Passive design takes into account the reduction of the burden of the thermal environment by taking advantage of airflow and shade. The house is designed in such a way as to let hot air in the summer escape from a window installed over a double height room and to plant trees in the garden and install window shades to reduce the direct sunlight from coming into the room through the windows. These various technologies applied to SECUREA Toyota Kakimoto enable us to reduce the capacity of the solar power system to 6.16 kW and achieve a house that can self-supply energy from spring through summer. This energy self-sufficient house is open to the public as a model house for a year after the completion. We are planning to organize various kinds of events and workshops in the house. Passive design uses natural sources, instead of depending on such energies as electricity and gas, to control the flow of heat and air to achieve comfortable living in summer and winter. In summer when the sun is high in the sky, the eaves and awning block incoming sunlight. 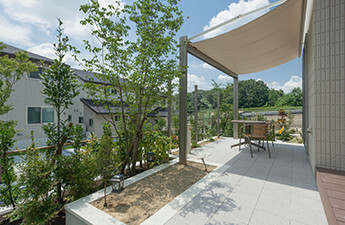 Heat-shielding plates are applied to the pavement to reduce heat radiation, and green plants are used as a fence to achieve transpiration effects in order to reduce the heat flowing into the room. The double height space, without a partition, allows the warm air from the living room to escape through the window located up near the ceiling. In winter when the sun is low in the sky and the leaves of the plants on the fence are shed, the awning can be folded to allow sunlight to come into the room. The effective use of ambient natural sources thus helps reduce the air conditioning load. 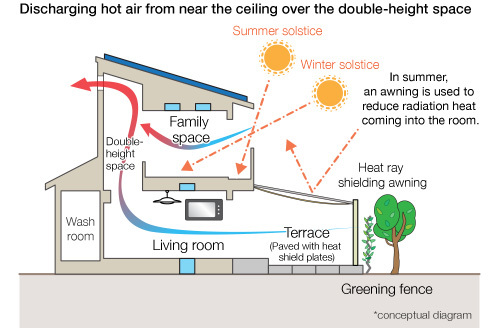 In spring and fall, ascending warm air in the ambient environment is used to expel the heat from the room to the outside, helping reduce the use of air conditioning. 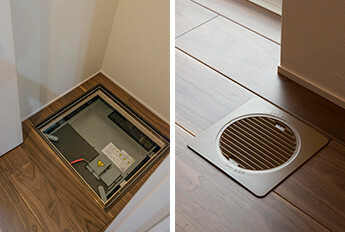 In summer, ventilation fans are operated automatically to force out the heat. In winter, dampers are closed to prevent cold air from entering the room. A heat exchanger type 24-hour ventilation system that adjusts the temperature of the outside air close to that of the air inside the room before supplying it. This system maintains a comfortable air environment and also contributes to reduced energy use by air conditioning systems. 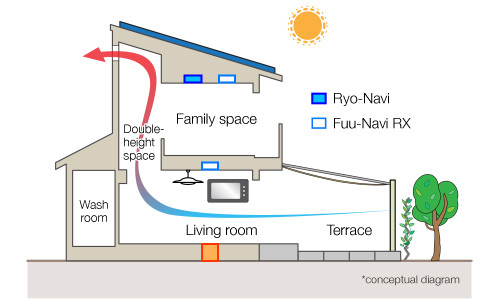 A system that supports air conditioning by taking advantage of cool air under the floor in summer.